Looking for something fun and unique to do in Stanwood? Start your day at the Cookie Mill and enjoy fresh baked scones, muffins, or a breakfast sandwich and a warm cup of coffee or espresso. Relax in their cozy cafe, take in the local scene in Stanwood and grab one of their delicious cookies for a mid-morning snack. Head on over to Stanwood’s new Grocery Outlet in mid-town and pick up some gourmet picnic items. They have a great selection of gourmet cheese, charcuterie, organic bread, and unique pantry items for a great price as well as park friendly beverages. They also have a famous selection of discounted wines to stock up on for enjoying at home. If you’re lucky, you’ll be there when they are hosting a wine tasting. After picking up some supplies for the day, make your way to Church Creek Park. 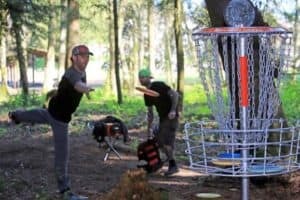 Did you know Stanwood has a frisbee (disc) golf course? Located at Church Creek Park, the disc golf course was installed in 2015 when local volunteers came together and spent 192 hours getting the parks course ready for frolfing! That’s one thing you’ll notice about this community, if you’re new to the area; the community really comes together to support like minded efforts! For more information on the disc golf course and the sport itself, visit the Church Creek Disc Golf site. Work up an appetite and enjoy your gourmet picnic in the park under the canopy of evergreens in this beautiful scenic park. After frolfing outdoors and perfecting your skills, drive over to Ale Spike, located in the QFC shopping Center in mid-town Stanwood. This bottle shop offers a wide variety of craft beers in bottle and on tap including their very own which is brewed on neighboring Camano Island. Grab a seat at the bar or get a table and enjoy a draft brew or just grab some bottles to take home and enjoy. Feeling the need for a sweet treat? Across the parking lot from Ale Spike you’ll see Sweet Bliss. Sweet Bliss is the favorite local spot to grab some froyo and give in to that sweet tooth. Help yourself to some birthday cake flavored froyo and top it off with chocolate and caramel and you have one amazing cup of goodness. Top your froyo with an amazing variety of nuts, candy, chocolate, and other goodies. Check out their facebook page for the latest flavors and specials they have going on. Who doesn’t love desert before dinner? Stanwood’s renowned sushi spot, Shima, is a great place to grab some epic sushi and sake or if that’s not your thing, head to Leatherheads Firehouse Restaurant for some great pub food and adult beverages. Both restaurants are fairly new to Stanwood and the locals are flocking to these new venues! If you’re looking for live music entertainment, Loco Billy’s in town has live music and dancing most nights, also check out The Stanwood Saloon for live music or karaoke on Friday and Saturday nights.